Last month we took a trip to Florida, and over the next couple of weeks we'll be presenting bits and pieces of that trip. We already spent an evening at Jesup, Ga., in a previous post. Today we'll look at at a railroad you probably never heard of -- the Augusta & Summerville. The Augusta & Summerville was chartered in 1866, but by 1900 it was jointly owned by the Southern Railway, the Central of Georgia, the Charleston & Western Carolina and the Georgia Railroad. 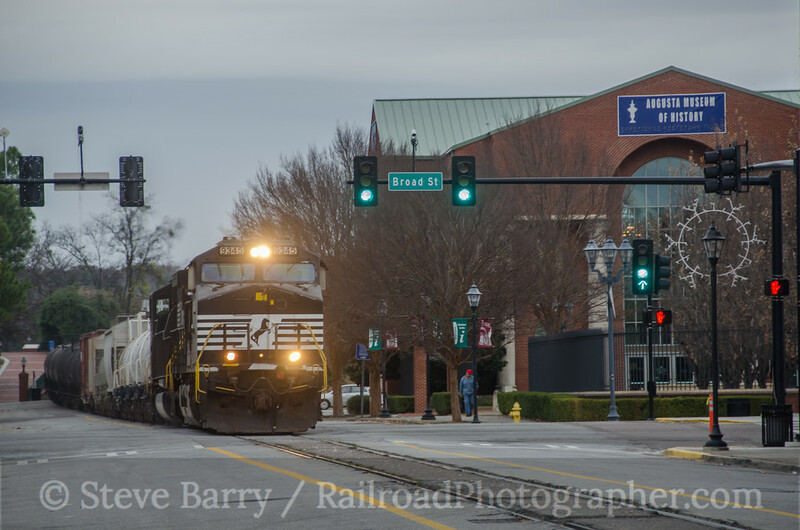 Today it is still jointly owned by the successors of these railroads, CSX Transportation and Norfolk Southern. The railroad is only about three miles long, but its "main line" rolls right down 6th Street in Augusta. Augusta is situated on the Savannah River directly across from South Carolina. At one time two lines converged at the north end of the bridge over the river -- the Southern and the Georgia & Florida (which later became a Southern subsidiary); the G&F line is now gone. After crossing the bridge the railroads became the Augusta & Summerville; the Georgia Railroad had two spurs branching both east and west off the A&S along the river, with the east line serving a freight house that still exists (all the trackage for both spurs is gone). the A&S wanders down the middle of 6th Street for several blocks, with the street running ending at a junction. The A&S had a line heading northeast here, going to Augusta's Union Station where the A&S ended. Beyond Union Station were two lines, the Georgia Railroad and Charleston & Western Carolina; these tracks are still used by CSX. Heading southwest from the end of the street running the A&S enters Augusta Yard, and beyond the yard the Georgia & Florida and the Central of Georgia continued on (both now used by NS). 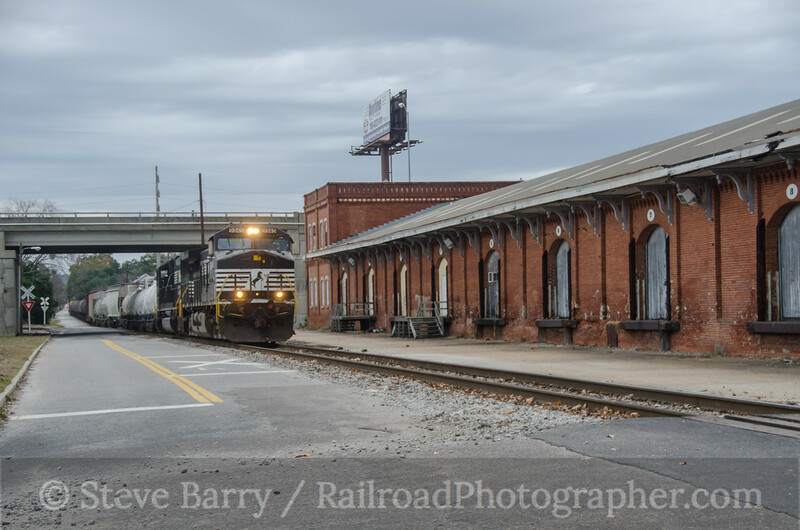 Finally, also branching off at the end of the street running and heading southeast is the former Charleston & Western Carolina, now used by CSX. 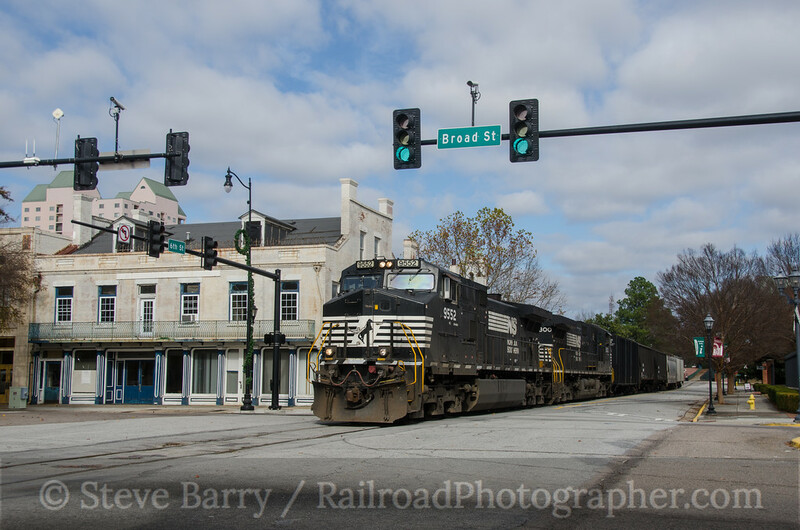 Today the A&S street running serves Norfolk Southern, while the branch to Union Station and beyond is used by CSX. On December 14 I was joined by my brother Bruce in Augusta to wait on two fairly reliable southbound morning trains, NS trains 155 and 191. The weather was rainy, so we set up for shots that would not be favorable if the sun was out. 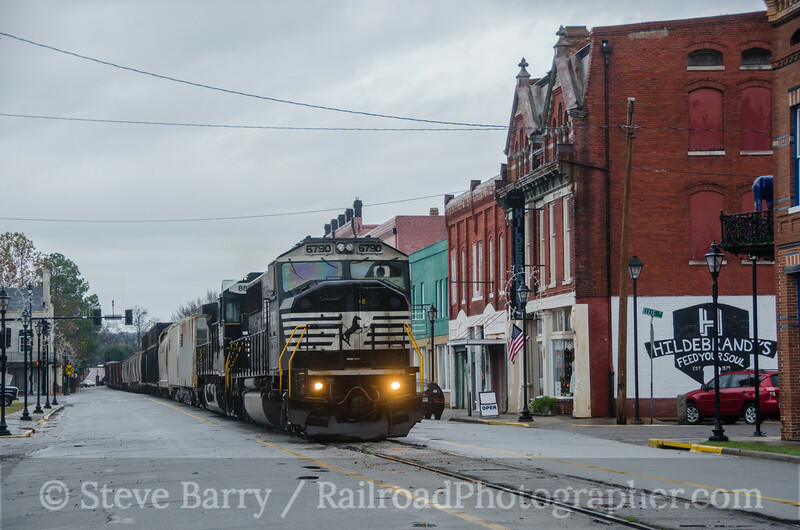 We got there at about 9:00 a.m., and at 10:30 train 155 showed up, passing the storefronts along 6th Street. The bar says "Vegas Show Girls." We doubted that was true. At the end of the street running the A&S freight house still stands. The A&S to Union Station diverges at a spot under the overpass and heads off to the left. About an hour later train 191 made an appearance. Hildebrand's is a combination restaurant/deli/general store. 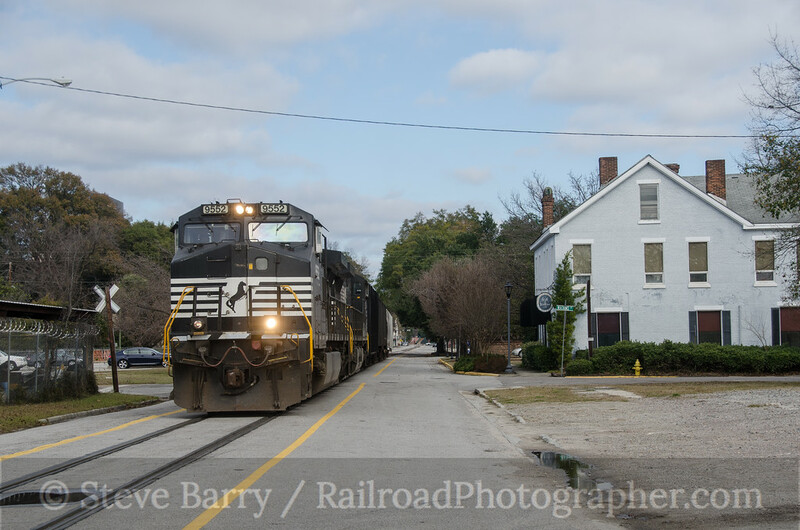 After these trains went by we headed over to the Sandersville Railroad to check them out. Alas, it was a Saturday and they weren't running. The rain had picked up throughout the day and we headed into the motel for the night. But about 8:00 the rain moved out and we decided to head back downtown to attempt a night shot in the street. We had no idea if a train was coming, but we figured we'd give it until 11:30 or so. This turned out to be highly entertaining. First, we got a visit from a local police officer who was the low man on the totem pole and wasn't assigned a regular police car -- he had a glorified golf cart. He was friendly and we had a good conversation. He lamented that whenever there was a call for all available units, he'd zip to the scene of the crime in his golf cart, only to find that the regular cars had beaten him there by several minutes and all the fun was already over. After he left, we had a long visit from a homeless man who told us all about Augusta and James Brown and other interesting tidbits. About 11:00 we heard a northbound train working the Norfolk Southern yard just south of the street running. This meant a train was indeed coming and also meant our 11:30 curfew was no longer valid. We set up our shot at the Blue Horse Cafe (now closed, as the homeless man explained to us, due to a dispute between the cafe and the state office building that owns the parking lot next to the cafe (and apparently didn't appreciate what the cafe's patrons were doing to the lot at night)). At 1:15 a.m. our train showed up. The next day the sun was out, so we decided to do the street running again. 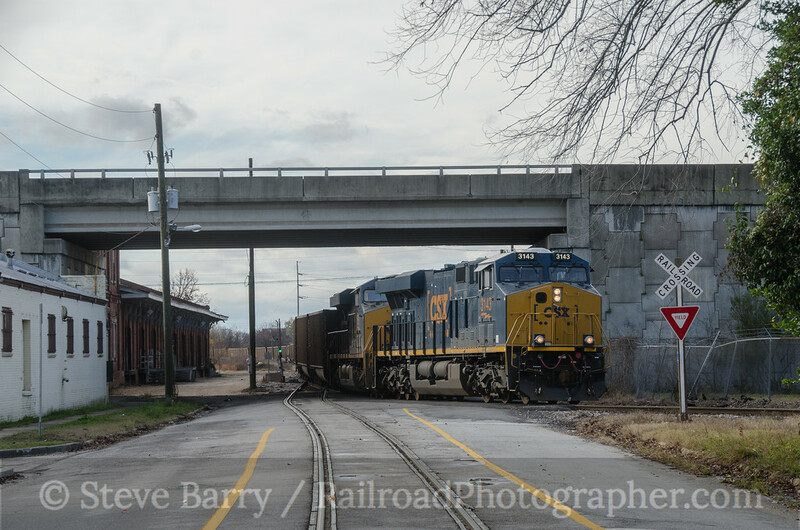 We got there at 9:00 once again and the first train we got was a northbound CSX train swinging briefly onto the A&S down by the freight house. Then came the bad news. We heard train 155 in the yard ready to go south. It had gone down the street earlier in the morning and we missed it. We also heard train 191 come to a stop on the north side of the bridge. At least we'll get that one! He sat for almost two hours, then finally came into Augusta. 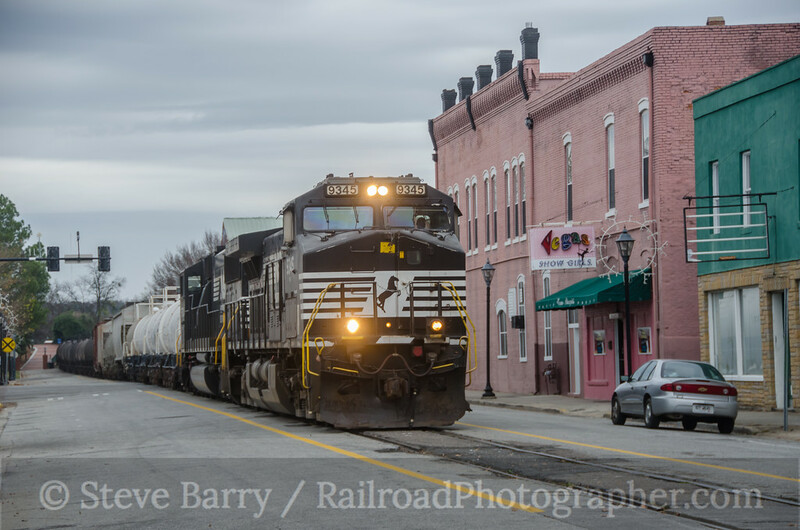 Since this was our only train and I had two locations I wanted to shoot, we used 5th Street to motor southward ahead of the train, coming out at the south end of the street running. 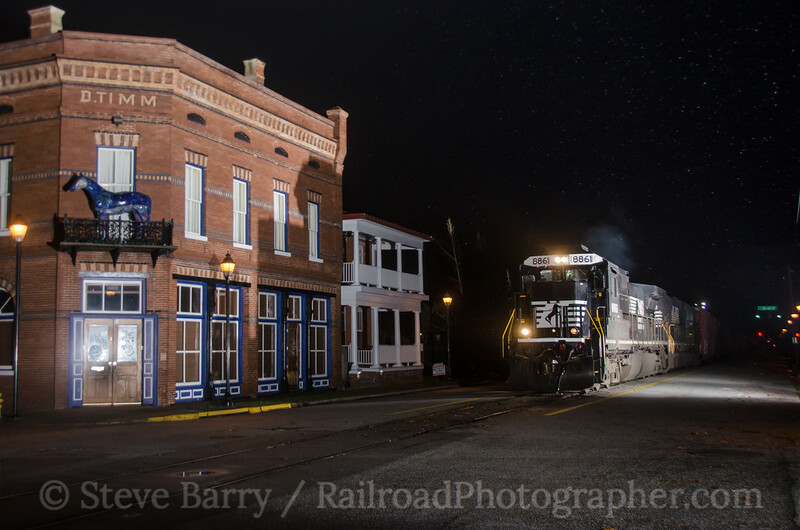 And that concludes our 27 hours along the Augusta & Summerville, a railroad you probably never heard about until today!